This is not an original recipe of mine but I had to share because it quickly became a favorite. I got this recipe from Half Baked Harvest , and I only changed a few minor things. This was a huge hit with my family. My sister is currently doing the “whole 30” diet so when I saw that this recipe would accommodate her ( and also looked appealing for us not on the diet) I immediately bought the ingredients to make it. Preheat your oven to 350 degrees. Wash your sweet potatoes and puncture them all over with a fork. Put them in the oven and bake for about 50 minutes or until tender. When done, cut the potatoes in half and allow to cool for about 10 minutes. In a bowl combine the olive oil, lime juice, garlic, ground chipotle peppers, oregano, chili powder, and salt and pepper to create your marinade. 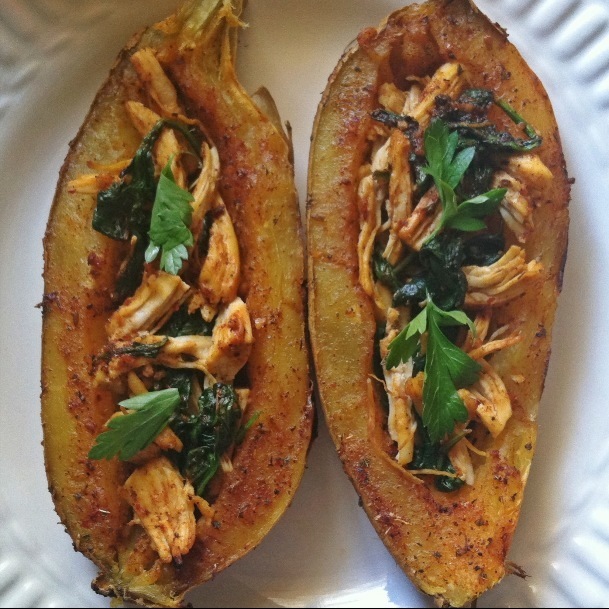 Set that aside and in a skillet saute your spinach until limp, and combine that with your shredded chicken.Now turn your oven up to 400 degrees. Scrape the sweet potato out, leaving quite a bit around the peel so it does not collapse. Brush the skins and inside of the sweet potato with the chipotle marinade and bake in the oven for 5-10 minutes or until crisp. While those are baking toss together the spinach, chicken and chipotle marinade . Remove skins from the oven and stuff with the chicken and spinach. * In the original recipe she uses white cheddar cheese, and greek yogurt to top the sweet potatoes. I didn’t use this since I was trying to make this recipe as “clean” as possible.